I cut the speedometer input wire at the plug just where the wiring goes into the trunk a 6 wire connector with a (white wire/black stripe) on one corner I cut this wire then ran the two extended wires (speaker wire works great) to my pocket on the right side, installed a switch just above this door, I used a switch that has a cover you open to turn on. Went for a ride. at any speed with cruise on I uncover, then flip my switch (now the wires are disconnected) give it a second and push my buttons to turn on my GPS , BINGO! GPS is on now I lower the cover on the switch which recloses the wires allowing the GPS to read input again. I used this style of switch because the covers come in various colors (mine is Carbon Fiber), most of these switches are metal, location gives some weather protection, mostly I can't inadvertently bump the switch and turn off the system. Re: Turning on your GPS without stopping! That is excellent investigational work. Thanks for sharing. The mod of using just a switch was mentioned in the original post and was posted back in 2009 on an other site and it will only work on the 2009 and up. Also in the original post it is stated that just cutting the speed sense and adding a switch will not work on 2006 - 2008 but if you can come up with a better way of doing the mod on 2006 -2008 please post . I would love to hear it. Now what do you think of my automatic activation mod for the nav ? Please post any improvement on that one. post any updates due to the people who either criticize or try to take credit for other peoples work. do we have a photo of this setup & also of the switch locATION? will this instruction work on a 2009 gl1800 with nav, cause you mentioned you applied this to a 2010 gl1800? That was a great idea thanks for sharing the info. A simple way is to switch your ignition to accessory position, push the gps button a few times and voila, gps works. Remember to switch ignition back to on position and it's smart if you engage clutch during process. You can either restart the bike with the start button or slowly release the clutch and the bike will bump start. Just be prepared if you do this in a lower gear because the bike may jump. 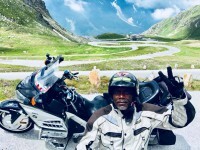 I suggest getting bike up to a reasonable speed, engage clutch, switch to accessory, push gps button several times, turn key to on position, push start button and slowly release the clutch. Re: Turning on your GPS without stopping on 2008 GL1800! I installed the "over ride" switch for "Turning on the GPS without stopping" on my 2008 GL1800. It works only if the clutch lever is pulled in. It does not work while normal riding. After the GPS is working, I change the selector switch back to normal. I prefer my way, it's quick, simple, safe and no modification to the bike, Oh yeah, zero cost. Your choice works well also. I installed the switch myself with already owned switch and wires (no cost). All I do is "switch", Clutch, push GPS buttons, "switch" and keep riding. I don't need to push clutch, shut off the engine by placing the ignition key in "ACC", push GPS buttons, switch ignition key back to run, start engine or bump start the engine. Safer? There are probably other ways, each to their own choices. They are all good. This has been a problem since Honda introduced the NAV in GoldWings. I came up with a system that's I believe will work for me. 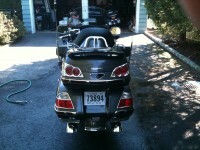 I have a 16 GoldWing. I add rocker switch and a small circuit with an Arduino and relay board. It's still in the design stage but when the switch is turned on, the pulse line is interrupted and the MAP button is pressed then the ENT button is pressed. A minute later, the pulse is re-enabled. If the switch is turned on when I start the GoldWing, it waits 25 seconds until the start screen is gone, then does the same thing. If the switch is turned on then off (or a pushbutton switch), the pulse is re-enabled as soon as the MAP and ENT buttons have been pressed and the switch is released. I have all the parts and it seems to do what I need in test. The cost is about 20 bucks. 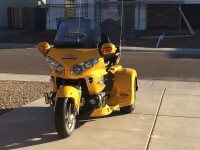 I'm waiting for warmer weather where my wife doesn't like to ride as much (AZ summers get warm) to put it in. It will take cutting the black/white pulse line and splicing in a wire to that and splicing in three wires to the control module in addition to power and ground. Comments are welcome and if you'd like the schematic and program for the Arduino, I'd be happy to share. How are you doing on that ? I would be interested in hearing how it is going. My first nav mod was very similar but used 556 timer and relays. You will find that it will be very reliable unless you operate other things, volume control, suspension, trunk or saddle bags open, etc. will defeat it at least on the 06-08. So will this mod give me full interactivity. I not looking to just turn the GPS on. I want to find gas stations, look at my turn list etc.etc.! Like the GPS in my car! I even called​ Garmin to ask for a reprogram to get rid of the lockout. They said "that is how Honda wanted it". Last edited by Toymechanic on Thu Aug 31, 2017 9:55 pm, edited 1 time in total. It is ridiculous that Honda put a lock out only on the GPS while moving. I can do anything with the radio,XM,I-pod, Aux, CB, Intercom, suspension, headlight adjustment, but for reason Honda doesn't want you trying to find your way unless you stop! Next they'll have an automatic helmet installer! Jinx, Everything works on the test bench. I haven't installed because I'm thinking of triking my 2016 and don't want additional wires in the way. I have a small arduino that is hooked up to a four relay panel. One relay is normally closed for the pulse line. One for the map button and one for the Enter button (last unused). The timing is stable since it's program controlled. I have a program written in Basic 4 Arduino (free) that runs everything. It's turned on by a pushbutton (only external interface) which also interrupts the pulse line for a minute if it's already on. Total of parts is under 20 (ebay and amazon) and everything fits inside a small plastic enclosure. It has seven wires coming out. I'd be happy to share the details with anyone who writes to me (schematic, program). Does this allow a person to use all of buttons on the right lower fairing? And is there a side effect to using it for a long time(for example like the time to read the turn list, etc )? The circuit I devised does not interfere with normal operation at all. Since it's micro-controller controlled, I set the delay time at initial for 25 seconds and the duration of the interruption for 1 minute. Both are adjustable in the program. If you hit the button within 25 seconds of starting the bike, it waits until 25 seconds has elapsed then interrupts the pulse, closes the contact for the map button for a half second, closes the contact for the enter button for a half second then re-connects the pulse line a minute later. Longer into the ride, it does the same thing without initial delay. As I said, I haven't installed yet as I'm triking but it does what I expect on the bench. So it interrupts the signal for up to a minute. So if I'm not done doing what I'm trying to do then I would just hit the button again and then continue mapping. I just keep hitting the button after every minute. Does it affect your tracking or where you've been or anything like that does that all still keep working? I would be interested in seeing the schematic! I am comfortable with electronics. I sent details. Regarding the button - It can be a button or a rocker switch. If the switch is on when you start the GW, it waits 20 seconds, hits the map, then enter buttons, waits a minute, then re-connects the pulse line and everything is back to normal. If you turn off the rocker before a minute, the pulse line immediately re-connects. If you have a pushbutton switch, the circuit does the same thing and re-connects the pulse line after a minute. If you are underway and you have a pushbutton, it activates the nav and re-connects after a minute. In theory, I wouldn't think the nav would be affected at all as it doesn't require the pulse to work. The pulse is only there to restrict button clicking while moving. This is speculation on my part. If anyone is sure about this, please let me know. My 2006 has nav but it is worthless when moving, you can't even zoom in or out! My solution is the one I also use in my car. I went to the app store and downloaded an app Called 'WAZE' on my Iphone. It is an interactive navigation app that lets you send and receive road conditions such as objects in the roadway ahead, position of police speed traps, accidents etc so you be heads up. WAZE is getting very popular and you can also plan a trip and contact friends! My wife and I use it on all trips. If you use the zoom switch on the left hand grip control you can zoom in and out while riding. JerryofAZ your mod is nice but if you put it in use you will find your timing needs to be changed. board. The current mod for my 2017, version 5, is completely undetectable. Anyone riding my bike would never know there is a lockout. The nav controls are accessible all the time. Sorry but this mod will never be released.